SatPC32 is the mostly used program by AO-40 users in Germany and now also becomes more and more popular world wide. Install Arswin and start it in ‘stand alone’ mode. the option ‘None’ (because SatPC32 will work as the client). Also, calibrate the rotor end positions. Make sure that hardware and software work flawlessly in ‘stand alone’ mode. Open the ‘Setup’ menu, ‘Rotor setup’. 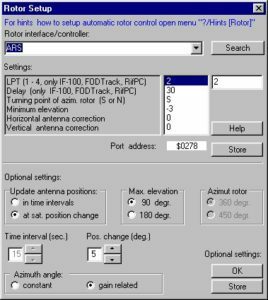 Click on the control of the combo box in the upper section of the window to open the list of rotor interfaces supported by SatPC32. In the list click on the item ‘ARS’. SatPC32 V. 12.4 this is no longer required. If you installed the ARS files into another folder SatPC32 will display a message saying that Arswin.exe could not be found. Click the button ‘Search’ and in the dialog field that opens navigate to Arswin.Exe, mark the file name and click the button ‘Open’. When you click the button ‘Store’ in the upper section of the menu path and filename of Arswin.Exe will be saved.